Sarah Caroline Olivia Colman (born 30 January 1974) is an English actress. She is the recipient of an Academy Award, four BAFTA Awards, four British Independent Film Awards and two Golden Globe Awards. A graduate of the Bristol Old Vic Theatre School, Colman came to prominence for her work in television. She made her breakthrough as Sophie Chapman in the Channel 4 comedy series Peep Show (2003–2015). Her other comic roles in television include Green Wing (2004–2006), Beautiful People (2008–2009), Rev. (2010–2014), Twenty Twelve (2011–2012), and Fleabag (2016–present). She also played various roles in That Mitchell and Webb Look (2006–2008), alongside her Peep Show co-stars David Mitchell and Robert Webb. 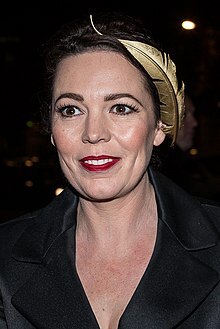 Sarah Caroline Olivia Colman (born 30 January 1974) is an English actress. She is the recipient of an Academy Award, four BAFTA Awards, four British Independent Film Awards and two Golden Globe Awards. A graduate of the Bristol Old Vic Theatre School, Colman came to prominence for her work in television. She made her breakthrough as Sophie Chapman in the Channel 4 comedy series Peep Show (2003–2015). Her other comic roles in television include Green Wing (2004–2006), Beautiful People (2008–2009), Rev. (2010–2014), Twenty Twelve (2011–2012), and Fleabag (2016–present). She also played various roles in That Mitchell and Webb Look (2006–2008), alongside her Peep Show co-stars David Mitchell and Robert Webb. Colman won BAFTA TV Awards for Best Female Comedy Performance for Twenty Twelve and Best Supporting Actress for Accused in 2013, before winning a BAFTA for Best Actress in 2014 for her role as DS Ellie Miller in the ITV crime series Broadchurch. For her performance in the 2016 thriller miniseries The Night Manager, she won a Golden Globe for Best Supporting Actress and was nominated for a Primetime Emmy Award. In film, Colman received critical acclaim for her performance in Paddy Considine's drama Tyrannosaur (2011). Her other major film roles include PC Doris Thatcher in Hot Fuzz (2007), Carol Thatcher in The Iron Lady (2011), Queen Elizabeth in Hyde Park on Hudson (2012), Bethan Maguire in Locke (2013), Margaret Lea in The Thirteenth Tale (2013), and the Hotel Manager in Yorgos Lanthimos's The Lobster (2015). Her portrayal of Anne, Queen of Great Britain in Lanthimos's The Favourite (2018) won her the BAFTA Award, Golden Globe Award, and Academy Award for Best Actress. Colman was born in Norwich, Norfolk, the daughter of Mary (Leakey), a nurse, and Keith Colman, a chartered surveyor. She was privately educated at Norwich High School for Girls and Gresham's School, Holt. Her first role was Jean Brodie in a school production of The Prime of Miss Jean Brodie at the age of 16. She cites her mother's interrupted career as a ballet dancer as an inspiration to pursue acting professionally. Colman spent a term studying primary teaching at Homerton College, Cambridge before studying drama at the Bristol Old Vic Theatre School from which she graduated in 1999. During her time at Cambridge, she auditioned for the Cambridge University Footlights Dramatic Club and met future co-stars David Mitchell and Robert Webb as well as Peter Serafinowicz. Colman has appeared in roles in many BBC, ITV and Channel 4 television programmes, such as Bruiser, People Like Us, Look Around You, Black Books, The Office, The Time of Your Life and provided the voice-over for Five's poll for Britain's Funniest Comedy Character. She regularly features in BBC Radio 4 comedies, such as Concrete Cow, Think the Unthinkable, The House of Milton Jones and Dirk Gently's Holistic Detective Agency. She is also the voice of Minka, the Polish secretary in the Radio 4 comedy Hut 33, set in a fictional codebreaking hut of the real-life Bletchley Park during World War II. Colman appeared as Bev, alongside Mark Burdis as Kev, in a series of television adverts for AA car insurance. She provided voices for the Andrex "be kind to your behind" adverts and Glade fragrance adverts, where her character is a gorilla. On several projects, Colman has worked with the comedians Mitchell and Webb. She joined them in 2003 to play the role of Sophie in the Channel 4 comedy Peep Show. Other joint ventures have included radio's That Mitchell and Webb Sound, and the television version That Mitchell and Webb Look. She decided to leave the programme after her agent suggested that she was becoming too closely associated with their work and needed to widen her horizons: a decision that was made "with tears". She continued to appear on Peep Show, though in a reduced capacity, until it ended in 2015. Colman had a recurring role in the surreal comedy Green Wing from 2004 to 2006. In October and November 2008, Colman appeared in the BBC sitcom Beautiful People, based on the life of Simon Doonan, as Debbie Doonan, Simon's mother. She also made a guest appearance in Skins, in the episode "Naomi" as Naomi's mother Gina. In 2010, Colman took a leading role as Alex Smallbone, the wife of an inner city vicar, in the BBC sitcom Rev. Also in 2010, she guest starred in "The Eleventh Hour" episode of Doctor Who, Matt Smith's debut as the Eleventh Doctor. In 2011, Colman appeared in the BBC drama Exile, written by Danny Brocklehurst and starring John Simm and Jim Broadbent. From 2011 to 2012, she played Sally Owen, the love-lorn secretary to Hugh Bonneville's character Ian Fletcher, in Twenty Twelve, a comedy series about planning for the 2012 Olympic Games in London. In 2013, Colman began playing DS Ellie Miller in ITV's Broadchurch. The crime drama series is set in the fictional Dorset town of Broadchurch, and follows the residents of a tight-knit community after a young boy is killed under suspicious circumstances. She was nominated for an International Emmy Award for Best Actress and won a BAFTA TV Award for Best Actress for her performance. Also in 2013, she starred as Margaret Lea, opposite Vanessa Redgrave, in the BBC television film The Thirteenth Tale. In 2016, Colman received praise for her performance as Angela Burr in the AMC/BBC miniseries The Night Manager, for which she was nominated for a Primetime Emmy Award and won a Golden Globe Award. That same year, she starred as Deborah Flowers in the Channel 4 black comedy series Flowers. She provided the voice of Strawberry in the Netflix/BBC animated miniseries Watership Down. In October 2017, Colman was cast as Queen Elizabeth II in the third and fourth season of the Netflix historical drama series The Crown. Colman's film credits include naturist Joanna Roberts in the 2006 mockumentary film Confetti – a role she described as "the worst experience of my life," Alice in the 2007 comedy Grow Your Own, and PC Doris Thatcher in the 2007 action comedy Hot Fuzz. Colman played a lead role in Paddy Considine's first two films, the short Dog Altogether (2007), and his feature directorial debut Tyrannosaur (2011). For her role in the latter, she won the BIFA Award for Best Performance by an Actress in a British Independent Film and the Empire Award for Best Actress. Colman played Carol Thatcher in the 2011 Academy Award-winning drama film The Iron Lady, with Meryl Streep and Jim Broadbent, for which she was awarded the London Film Critics' Circle Award for British Actress of the Year. She then starred in Yorgos Lanthimos' 2015 absurdist dystopian film The Lobster with Rachel Weisz and Colin Farrell, for which she was nominated for the London Film Critics' Circle Award for Supporting Actress of the Year and won the BIFA Award for Best Supporting Actress. In 2017 Colman played Hildegarde Schmidt in the remake of Agatha Christie's Murder on the Orient Express. Hildegarde Schmidt works for the Princess Dragomiroff as her lady's maid. In 2018, she starred as Queen Anne in Lanthimos' film The Favourite, opposite Emma Stone and Rachel Weisz. She gained 16kg (2st 7lb or 35lb) in weight for this role. For her performance, she won the Academy Award for Best Actress, the Golden Globe Award for Best Actress – Motion Picture Comedy or Musical, and the BAFTA Award for Best Actress in a Leading Role. Colman met her future husband, Ed Sinclair, then a third-year law student who had become disillusioned with law and preferred to write, in a production of Alan Ayckbourn's Table Manners (from the Norman Conquests trilogy) at Footlights. Colman and Sinclair married in August 2001 and have three children together. Since 2013, Colman has been a judge on the panel of the Norwich Film Festival. In July 2018 Colman was a subject of the UK genealogy programme Who Do You Think You Are? Colman expected that her family tree would relate mainly to Norfolk, where her father's family have been resident for generations. In the course of research undertaken into her mother's family, however, it was discovered that one of her ancestors was Richard Bazett, who had publicly accused his wife of adultery but had fathered two children with another woman. Bazett had worked in London for the East India Company. Bazett's son, Colman's great-great-great-grandfather Charles Bazett, married Harriot Slessor. Researchers discovered that she was born in the city of Kishanganj, in northeastern India, to an Indian mother and British father. Evidence shows that her mother was more than likely a local Indian woman. She lost her British father when she was aged 3 and then made the journey to England alone; this passage was paid for by her paternal grandmother. Colman also learnt about her French Huguenots ancestors who arrived in England as refugees. In 2013, Colman presented two awards at the Mind Media Awards, which celebrate accurate, responsible and sensitive portrayals of mental health across all areas of the media. Colman believes that "the media industry has huge influence and with that comes a responsibility to contest the stigma that sadly still exists, through accurate representation." Colman has spoken openly to the Big Issue about her experience of postnatal depression after the birth of her first child. Inspired by her research for the film Tyrannosaur, in 2014, Colman became the patron of the UK charity Tender, which uses theatre and the arts to educate young people about how to prevent violence and sexual abuse. Colman says that domestic violence prevention can make a real difference in the lives of young people. Other charity work included participating in the Alzheimer's Society's Holkham Hall Memory Walk in September 2013. Colman's great-grandmother suffered from dementia and her mother was involved in running a nursing home for sufferers. Colman has also added her voice to charity campaigns for Marie Curie Daffodil Day (care for the terminally ill) . Colman became Patron of blood cancer charity Anthony Nolan in 2018, which Colman says helped a friend of hers. In August 2014, Colman was one of 200 public figures who were signatories to a letter to The Guardian opposing Scottish independence in the run-up to September 2014's referendum on the issue. In December 2014, Colman was involved in a radio documentary about the plight of women in Afghanistan on behalf of Amnesty International for the BBC. Several women who told their stories to journalist Lyse Doucet were unable to appear because their lives might have been at risk. Colman read their stories as part of the documentary. In response to the work, Colman warned that the UK must not abandon Afghan women to the Taliban. She said, "Being a teacher, a doctor, a politician – these are important jobs but they shouldn't be dangerous ones. The brave women whose words I've voiced risk so much to educate, to care and to shape the future of their country. Women like these are the hope for Afghanistan's future and the UK must not abandon them to the Taliban now." People Like Us Pamela Eliot Episode: "The Vicar"
Mr Charity Distressed Mother Episode: "Nice to Feed You"
Comedy Lab Linda Episode: "Daydream Believers: Brand New Beamer"
Holby City Kim Prebble Episode: "New Hearts, Old Scores"
The Office Helena Episode: "Interview"
Eyes Down Mandy Foster Episode: "Stars in Their Eyes"
2004 Black Books Tanya Episode: "Elephants and Hens"
Swiss Toni Linda Byron Episode: "Troubleshooter"
NY-LON Lucy Episode: "Something About Family"
Coming Up Receptionist Episode: "The Baader Meinhoff Gang Show"
Murder in Suburbia Ellie Episode: "Golden Oldies"
ShakespeaRe-Told Ursula Episode: "Much Ado About Nothing"
2008 Love Soup Penny Episode: "Integrated Logistics"
2009 Skins Gina Campbell Episode: "Naomi"
Midsomer Murders Bernice Episode: "Small Mercies"
2010 Doctor Who Mother Episode: "The Eleventh Hour"
2012 Accused Sue Brown Episode: "Mo and Sue's Story"
The Secrets Pippa Episode: "The Dilemma"
This is Jinsy Joan Jenkins Episode: "The Golden Woggle"
↑ "Olivia Colman battled with Wikipedia to get her incorrect age changed". The Independent. 28 January 2019. ↑ "Television in 2013 | BAFTA Awards". awards.bafta.org. ↑ Fitzherbert, Henry (2 January 2012). "Olivia Colman on the fast-track to becoming a national treasure". Daily Express. Retrieved 22 March 2013. ↑ "Olivia Colman interview". The Daily Telegraph. London. 20 August 2012. Retrieved 22 March 2013. ↑ Briggs, Stacia. "Check out the photograph from Olivia Colman's family album which appears on her episode of Who Do You Think You Are?". 1 2 "Olivia Colman: "I immediately knew I would marry him"". Big Issue. Retrieved 12 December 2015. ↑ "Olivia Colman". David Tennant Does a Podcast With... Retrieved 20 February 2018. 1 2 Watts, Halina (23 March 2013). "Broadchurch star Olivia Colman says she's lucky not to be a classic beauty". Daily Mirror. ↑ Nannar, Nina (7 January 2016). "Famous alumni from Bristol's Old Vic Theatre School". ITV.com. Retrieved 10 September 2017. ↑ "Maggie, Meryl, and my modest career". The Herald. 29 December 2011. ↑ "Sarah Dempster talks to Olivia Colman". The Guardian. London. 18 June 2007. ↑ Preston, John (30 December 2013). "Olivia Colman: the star of Broadchurch on her new BBC drama". The Telegraph. London. ↑ "Class act: Is Olivia Colman Britain's most versatile actress?". The Independent. Retrieved 12 March 2016. ↑ Cary, James (3 February 2009). "Starting Writing an Episode". Hut 33 blog. Retrieved 10 March 2009. 1 2 Dempster, Sarah (18 June 2007). "Fame is quite scary". The Guardian. London. Retrieved 17 July 2007. ↑ "2008 Interview with Olivia Colman – Beautiful People". The Times. Retrieved 3 December 2012. ↑ Villarreal, Yvonne (2 August 2013). "Olivia Colman on 'Broadchurch' coming stateside, 'Doctor Who' rumors". Los Angeles Times. Retrieved 30 September 2013. ↑ Maerz, Melissa (15 August 2013). "Broadchurch review". Entertainment Weekly. Retrieved 30 September 2013. ↑ Tartaglione, Nancy (8 May 2014). "BAFTA TV Awards: 'Broadchurch' Wins Drama Series, Olivia Colman Lead Actress". Deadline Hollywood. Retrieved 6 January 2017. ↑ Kemp, Stuart (5 June 2013). "Vanessa Redgrave, Olivia Colman to Star in BBC Drama 'The Thirteenth Tale'". The Hollywood Reporter. Retrieved 6 January 2017. ↑ Petski, Denise (5 March 2015). "Olivia Colman, Tom Hollander, Elizabeth Debicki Join AMC's 'The Night Manager'". Deadline Hollywood. Retrieved 6 January 2017. ↑ Prudom, Laura (6 April 2016). "First Look: Olivia Colman and Julian Barratt Star in Seeso Dark Comedy 'Flowers'". Variety. Retrieved 25 April 2016. ↑ Jaafar, Ali (27 April 2016). "'Watership Down': BBC & Netflix Team on Miniseries With James McAvoy, Nic Hoult And John Boyega". Deadline Hollywood. Retrieved 28 April 2016. ↑ Birnbaum, Olivia (26 October 2017). "Olivia Colman Joins 'The Crown' as Queen Elizabeth for Seasons 3 and 4". Variety. Retrieved 2 January 2018. ↑ Matthewman, Scott (30 June 2010). "Olivia Colman: The Stage Podcast #67". The Stage. London. Archived from the original on 9 July 2010. Retrieved 30 July 2010. ↑ Brooks, Xan (24 October 2013). "Ben Whishaw and Olivia Colman cast in new film from radical Greek director". The Guardian. Retrieved 6 January 2017. ↑ "Olivia Colman: 20 things you didn't know about the Oscar-winning actor". Guardian. 25 February 2019. Retrieved 26 February 2019. ↑ Jaafar, Ali (24 September 2015). "Emma Stone & Olivia Colman in Talks To Board Yorgos Lanthimos' 'The Favourite'". Deadline Hollywood. Retrieved 6 January 2017. ↑ "Olivia Colman wins best actress Oscar for The Favourite". Guardian. 24 February 2019. Retrieved 25 February 2019. ↑ Maslow, Nick (8 January 2017). "The Night Manager's Olivia Colman Wins Best Supporting Actress Golden Globe". People. Retrieved 9 January 2017. ↑ Wiseman, Andreas (2 December 2018). "British Independent Film Awards: 'The Favourite' Wins A Record Ten Awards". Deadline Hollywood. Archived from the original on 6 December 2018. Retrieved 2 December 2018. ↑ Cooke, Rachel (8 December 2013). "Olivia Colman: "At the Bafta dinner, I said to my husband: Can we go home? I want a cup of tea"". The Observer. ↑ Curtis, Nick (7 February 2012). "Olivia Colman on winning Best Actress at the Evening Standard Film Awards". London Evening Standard. ↑ Lockyer, Daphne (4 May 2013). "Broadchurch sensation Olivia Colman: "I'm never cast as the love interest"". Daily Mail. London. ↑ "Five facts about Broadchurch star Olivia Colman". Hello!. 14 May 2013. ↑ Graham, Jane (15 May 2013). "Olivia Colman: "I immediately knew I would marry him"". Big Issue. ↑ Hoyle, Ben (February 25, 2019). "Olivia Colman: Babysitter sent video of kids watching me win Oscar". The Times. Retrieved 25 February 2019. ↑ Freezer, David (1 May 2013). "TV star revisits Norfolk roots for Norwich Film Festival". Eastern Daily Press. ↑ "Programme guide: Who-Do-You-Think-You-Are-series-15-2-olivia-colman". bbc.co.uk. Retrieved 10 July 2018. ↑ "The Telegraph/2018/07/09 Who Do You Think You Are? review of Olivia Colman's episode". The Telegraph. Retrieved 10 July 2018. 1 2 "TheGenealogist featured article: Olivia Colman". TheGenealogist. Retrieved 10 July 2018. ↑ "When Oscars 2019 winner Olivia Colman found her roots in Kishanganj in Bihar". 2019. 1 2 "Olivia Colman - Who Do You Think You Are". 2018. ↑ "Radio Times article: Olivia Colman's Who Do You Think You Are?". radiotimes.com. Retrieved 10 July 2018. ↑ "Scott Mills announces winners at 20th Mind Media Awards, sponsored by Virgin Money Giving". Mind. Retrieved 12 December 2015. ↑ "Tender Welcomes New Patron Olivia Colman". Tender. Retrieved 12 December 2015. ↑ "Olivia Colman joins hundreds on Memory Walk to fight dementia". Alzheimer's Society. Retrieved 12 December 2015. ↑ "Olivia Colman and Jim Carter voice our new radio campaign". Marie Curie. Retrieved 12 December 2015. ↑ "MEET OUR NEW PATRON: OLIVIA COLMAN". Anthony Nolan. 2018-07-04. Retrieved 2019-02-18. ↑ "Olivia Colman's BBC Radio 4 appeal for Anthony Nolan". Anthony Nolan. Retrieved 12 December 2015. ↑ "Celebrities' open letter to Scotland – full text and list of signatories". The Guardian. 7 August 2014. Retrieved 26 August 2014. ↑ Wharton, Jane. "UK must not abandon Afghan women to the Taliban, warns Olivia Colman". Daily Express. Retrieved 12 December 2015.